Don't expect the iPhone 4S in the Philippines till December at the earliest. GSM Arena has a list of iPhone 4S launch dates, and we are not on it yet. Less battery life? 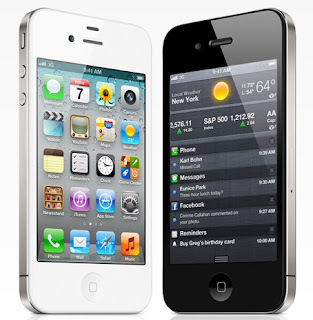 Phone Arena compares the new Apple iPhone 4S with the older iPhone 4. Two things struck me. While the two phones looks the same, the iPhone 4S is actually 1mm taller. No 4G? PCMag asks if the iPhone 4S can survice without 4G? The new iPhone 4S has HSPDA+ 14.4 support which is twice as fast as data transfer on the the iPhone 4 which supported only HSDPA. HSDPA+ 14.4 means 1.5 to 2 Mbps download speeds in the real world. But this just means it catches up with 2010 Androids like the HTC Desire HD which already came with HSDPA+ 14.4. Android being released today come with true HSDPA+ 21 or even faster 4G or LTE connectivity. The next iPhone will be coming in six months or less. I think we will be seeing a iPhone 4G (or 4GS) or even a new iPhone 5 before before Q2 2012. I do not see how long Apple can hold off giving their phone faster wireless connectivity. Better camera. Techcrunch looks in depth look at the improved 8MP f/2.4 with a back lit camera of the iPhone 4S. But is that really new? Sony Ericssons XPeria Arc already came out with a camera with a back ;it sensor. The HTC Titan already came out with a 8MP f/2.2 camera last month, which also features a back lit sensor just like the unit in the iPhone 4S. We expect to see this camera appear on other HTC phones as well. The best phone camera in the business would still appear to be the Nokia N8 with its large 1/1.83" sensor. Better camera yes, but we will have to wait for comparisons to find out if it is really groundbreaking. Disappointed? The Apple faithful may still claim this is the perfect phone, but the Apple share price dropped a whole 5% with the new release. With the iPhone 4, Apple was playing catch up with phone like the Google Nexus One, which it did. With the iPhone 4S, has Apple caught up with phones like the Samsung Galaxy S II? Not completely. Even it did, a new round of Android will be out before the end of the month. Now the ball is in Google's court.